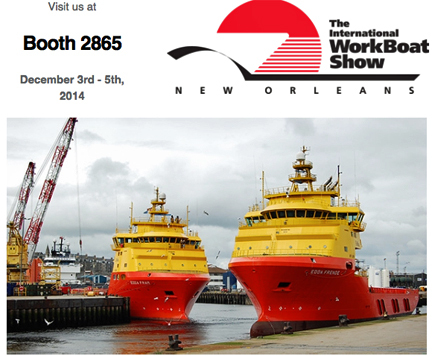 [SatNews] GPLink will be featuring their technologies during The International WorkBoat Show in New Orleans, Louisiana, from December 3rd through 5th. gplink uses dual band technology with GSM and Iridium satellite networks to monitor commercial vessels and high horsepower systems. With these worldwide networks and the company's round-the-clock monitoring, support and notification system, workboat productivity can be maximized from a desktop computer or mobile device. Whether a single vessel or a vast fleet, gplink is designed to help keep vessels on the water longer and increase a company's bottom line. Downloadable reports for fuel burn and engine hours for a specific time frame are now available through the gplink system. This reporting feature allows customers to track historical data for one boat or an entire fleet in near real time from any computer or Internet-connected device. The gplink system also identifies potential engine problems before they happen to help minimize down time by using chronological diagnostic reports. If repairs are needed, a technician can be granted access to the generated reports to help diagnose any problems or operating discrepancies.